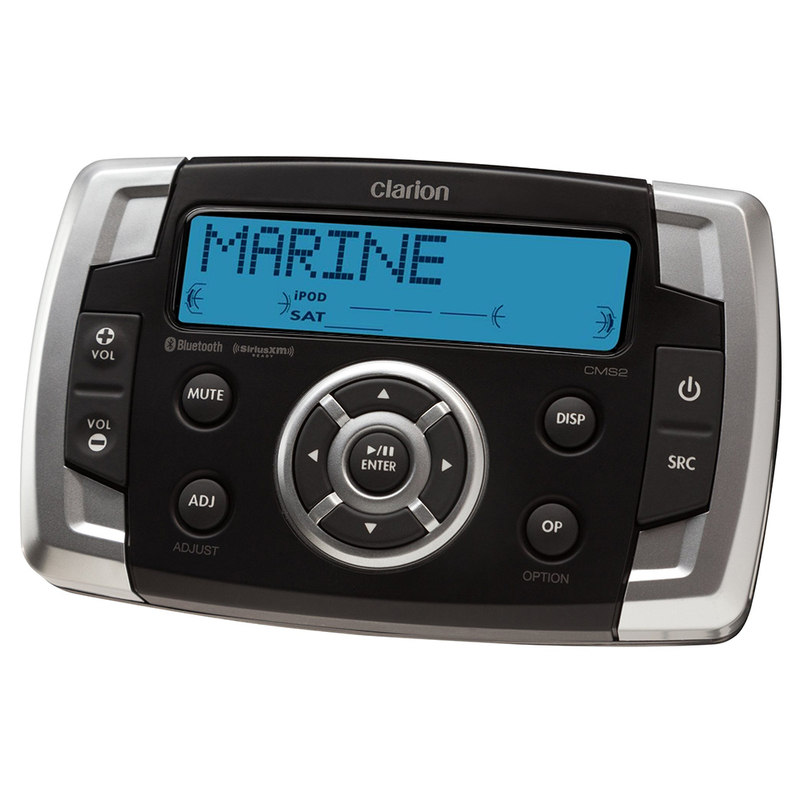 Clarion’s CMS2 is a digital media hub that has been designed specifically for boats with a compact Black Box and weather protected controller. The essentials including Bluetooth® for Stereo Streaming and AM/FM/Weather Band are built in, with a wide variety of connections including SiriusXM® Satellite Radio, AUX and USB so you can create a system that gives you a custom audio listening experience. CMS2 was designed to offer maximum protection combined with maximum enjoyment of today's audio sources. Developed to enhance our listening experience with Bluetooth, smartphone interface, AUX Input RCA's, SiriusXM interface, and USB 1.1A Input. Connect your compatible devices to create a custom listening experience that can be enjoyed on land or at sea. Get the information you need at a glance. The 3-line dot matrix LCD display makes it easy to look through your radio or satellite radio presets, smart device content lists, and USB music folders. If you’re an owner of an smartphone, you’ll be happy to know that the music stored on it can be enjoyed on your boat’s audio system, just like you would on land. Built-in Bluetooth provides stereo streaming with a wide variety of Bluetooth compatible devices. Play music stored on your connected Bluetooth device, whether it's a mobile phone or a portable audio player, with wireless convenience. List display is possible when using a smartphone supporting the Bluetooth profile AVRCP1.4. Connecting an optional SiriusXM-Connect Vehicle Tuner gives you access to over 140 channels, including commercial-free music, sports, news, talk and entertainment. Artist, Song, and Replay functions, make it easy to keep up with your faves. With the CMS2 Black Box installed, you can control everything from the wired watertight controller. It's simple robust design maximizes reliability. With the vibrant color display allows for simple functionality with enhanced durability that can resist the most harmful of elements.